The Miata's fiery evolution is tempting us to dip into our retirement funds. 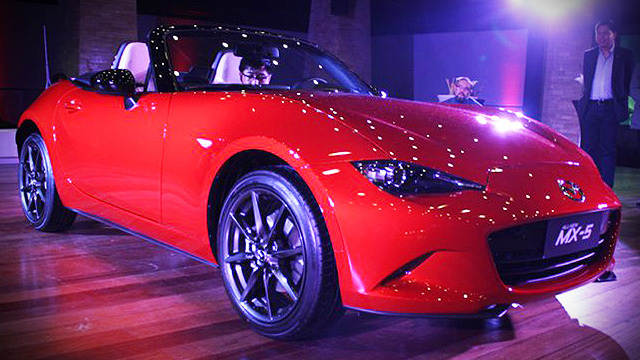 The all-new Mazda MX-5—one of the world's most famous roadsters—has finally been launched in the Philippines. If you're looking to turn more than a few heads on the road, the incredible-looking two-seater should be on your list. The Philippine-market MX-5 will be powered by a 2.0-liter Skyactiv engine rated at 158hp and 200Nm. It can be mated to either a six-speed manual or six-speed automatic transmission. The automatic goes for P1,860,000 while the manual goes for P1,680,000. The cars are available in Soul Red, Ceramic, Crystal White Pearl and Jet Black. Tom Matano, the designer of the first-gen MX-5, was also at the event who lauded the new car's progressive design: "More modern touches than the previous generation, and that's what we needed it to be. More modern, not retro, but still unmistakably Miata." "There's more to a car than four wheels and an engine. Designers and engineers search every nook and cranny for the inspiration necessary to breathe life into a project, in hopes of making a vehicle that connects with a driver rather than just transports him. The people at Mazda know this, and none better than Tom Matano himself, the man behind the exterior design of the first-generation Miata (aka MX-5). Matano was present Thursday night for the Philippine launch of the all-new Mazda MX-5, and the designer nearly stole the show from the roadster itself and its much-younger designer (who was also in attendance)--hard to believe considering the new roadster's eye-catching design. The MX-5 exterior features added depth to the Mazda Kodo design language in the form of sleeker-looking headlights and sweeping lines that converge right before the vehicle's rear tires and sweep over the rear fender. The car maintains the unmistakable shape and proportions of a Miata, with a handful of new accents to the body and trim. Interior-wise, the new MX-5 boasts a cockpit design where the body panels wrap around the door trim, allowing the exterior and the interior to blend seamlessly into one another to give the sports car a more spacious appearance. Knobs and dials are highlighted via chrome accents, while a seven-inch touchscreen controls the infotainment system. The interior comes in black or tan leather, or black fabric. Will the new Miata be able to build on the legendary success of its predecessors? With its sleek design, classy interior and universal appeal, we certainly think so."